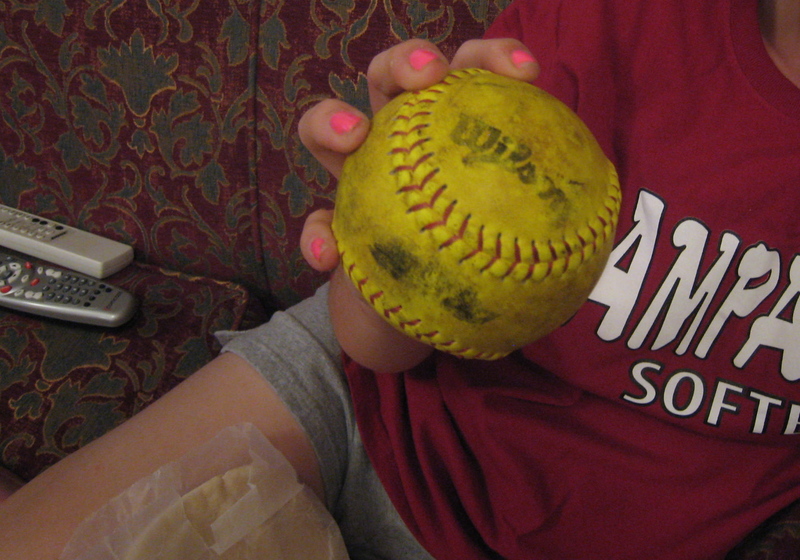 This is Tory's first high school game ball. High School softball is officially over in our town. Tory and her teammates played hard and won more games this season than any previous varsity softball team at the high school has won ever. Tory pitched 8 games and was the winning pitcher 8 times. For me, the really fun softball season is just beginning: Summer club ball. I love to watch Tory play softball. For the past 2 years Tory played with a club team out of Bergen County, NJ. The girls played U14 ball, and last year, they were good enough to win a tournament, duke it out for second place in a couple of others, then go to Disney to compete last July. I went along as a chaperone and it was awesome. Tory's softball glove of choice! Ever since Tory picked up her first softball glove at 6 years old, I’ve watched her practices and games. She’s played on Rec teams, Town Travel teams, and Club teams. When she was 14 she played on 3 different teams at the same time. Tory loves softball. She’s worked hard to become a terrific pitcher and first baseman. She wants to play in college. In past years, summer club softball was about sending the best 9 players onto the field in an attempt to win a trophy or a berth to softball Nationals. As a parent it was fun to watch and you knew what to do: You cheered for your child’s team. . .to win. This year, it will be different. This year Tory is playing on an 18U Gold Team. These teams attend “Showcases,” which are tournaments that allow high-level softball players to show their particular skill sets – be it pitching, hitting, fielding, catching — in a game setting to the many college softball coaches who attend these tournaments. The player is looking to find a college to play for and the coach is looking for players to play for their college. Competition is fierce, I hear. Trophies aren’t awarded to the winning team. “Winning” is when an individual athlete connects with a college coach. I’m not sure how this actually works so for the next 8 weekends I’ll be watching, and listening and learning right along with Tory. Summer Softball: Where the real action is, to me. Please say a prayer for my girl. She’s a hard worker chasing a dream!